This past July marked the 46th anniversary of mankind’s first steps on the moon. You’re probably familiar with the words uttered by Apollo 11 astronaut Neil Armstrong, “That’s one small step for man, one giant leap for mankind.” However, there are many fascinating facts regarding the mission that aren’t common knowledge. Following are intriguing details that will knock your socks off and boggle your mind. For a picture of the seismic experiment used to measure vibrations, click here. The Apollo 11 mission had three modules, the Lunar Module “Eagle,” the Command Module “Columbia,” and a Service Module. The Eagle was the craft that landed on the moon. The Columbia contained the crew’s quarters and supplies. The Service Module was attached to the Columbia. It housed the main engine, supplied electric power, and maintained the crew’s life support system. Three astronauts deployed the mission. The Eagle was manned by Pilot Buzz Aldrin and Commander Neil Armstrong. Pilot Michael Collins orbited the moon in Columbia, photographed the lunar surface, and maintained communication with the Eagle. NASA’s manufacturing standards are precise. The Phoenix Specialty company was a prime source of Apollo 11 aerospace parts. Prior missions were plagued with hardware problems. The glitches had compromised crew safety and mission objectives. Fortunately, NASA engineers had learned from previous errors, so Apollo 11 was not subject to the same issues. Although Commander Armstrong referred to his first step on the moon as “small,” it was actually a leap of 3.5 feet. The landing plan was to cut the Eagle’s engines when it hovered a few feet above the surface. NASA engineers had built the Eagle with legs that would fold upon impact and act as shock absorbers. The Commander was such a stellar pilot that the Eagle landed softly, and the legs didn’t compress. Consequently, the astronauts had to exit the Eagle from a height several feet above what was intended. 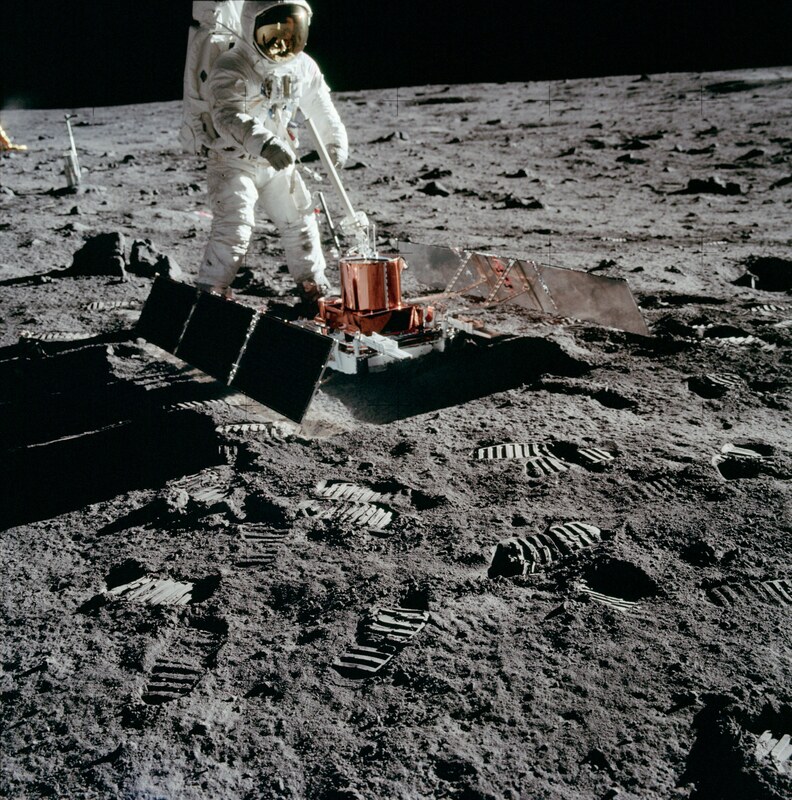 The first small step was really a hop of 3.5 feet from the Eagle’s ladder to the lunar surface. The astronauts were surprised by the moon’s pungent odor. It was especially obvious once back inside the Eagle. As the crew removed their spacesuits, the moon’s fine powder that had collected in the creases was released. It coated everything, including the astronauts’ hands and faces. Tasting the moon dust was another unpleasant consequence. The chemical reaction of the dust with oxygen created a funky smell. The astronauts likened it to the odor of gunpowder and wet ashes in a fireplace. The pressurized gear worn by the crew was made by employees of the International Latex Corporation (ILC). There’s a little fiasco surrounding this fact. NASA invited ILC and Hamilton Standard (HS) to bid for the spacesuit design. HS had been NASA’s primary contractor. However, the competition resulted in NASA’s rejection of the HS suit, and the company lost their contract. A few years later, NASA again announced a competition for a new spacesuit. Several retired ILC employees broke into their former offices. The women stole back their original designs and refined them. NASA was impressed by the ladies’ work and awarded them the contract. HS took second place with the assignment of providing oxygen tanks for the suit. A basic spacesuit consists of 11 layers of material. With the synchronized efforts of various departments, it takes three months to manufacture one suit. If making a suit was limited to the skills of just one person, it would take 2.5 years. Spacesuits are always white since the color reflects heat. Temperatures in space can exceed 275 degrees Fahrenheit. The Apollo suit weighed an average of 180 pounds. The toughest moonwalk task was planting the American flag. NASA’s research had suggested that lunar soil was soft. Reality proved otherwise. The moon’s surface was hard rock coated with dust. The astronauts had to force the flagpole a few inches into the surface. Then they needed to be careful to avoid knocking it down the flag that was supplied by Sears. The hydrogen gas filters on Apollo 11 malfunctioned, making every drink fizzy. This caused the astronauts much stomach discomfort. When the Eagle separated from Columbia, the cabin wasn’t fully depressurized. The burst of gas generated sounded like a Champagne cork popping. The powerful force catapulted the Eagle four miles from its planned landing point. Apollo 11 cuisine was an improvement over the food of prior missions. Tubes of stew and applesauce were replaced by meals that could be heated and eaten with cutlery. However, not every meal was tasty. The crew’s first meal was bacon cubes glazed with gelatin to prevent crumbs. During previous missions, astronauts experienced severe weight loss. Apollo 11 meals were designed to prevent this. Calorie-dense food was provided to offset the astronauts’ energy expenditures. For example, Buzz Aldrin burned 300 calories an hour while working on the lunar surface. This is equivalent to an hour of yard work. Meals had to be compact, lightweight, and crumb-free due to the effect of zero gravity. Otherwise, food would float and fly through the cabin. To avert culinary casualties, NASA scientists developed “wet pack” food. It was thermo-stabilized to retain moisture and enabled the crew to smell their meals, making them more appealing. Moist food also stayed put on utensils. Thus, the crew was able to enjoy chicken stew, pork with scalloped potatoes, and sausage patties. Dessert treats were pineapple cake, chocolate pudding, and bite-sized brownies. Many people contributed to the success of Apollo 11, from factory workers to food scientists. Just like Phoenix Specialty washers, each person involved was a key cog in the machinery of the mission. Special honors go to the engineers, astronauts, nutritionists, Sears, and the women who sewed the spacesuits. The mission solved many lunar mysteries. Scientists gained knowledge of the moon’s evolution, composition, structure, and activity. Technology and materials used in the space program led to the refinement of TV satellite dishes, sunglasses, medical imaging devices, smoke detectors, golf balls, and cordless power tools. Apollo 11 paved the way for developing global positioning devices, weather satellites, and food preservation techniques. Scientists learned that the moon is lifeless. It has no fossils, living organisms, or native organic compounds. Comparing the moon with Earth highlights our planet’s preciousness. Our globe is a vibrant oasis in the vastness of space, a world to be protected and cherished.